Otherwise known as norovirus, the illness affects up to three million people each year in the UK with most cases reported during the cooler months from November to April, although it can be contracted year-round. The virus causes inflammation of the stomach and intestines, which can lead to vomiting and diarrhoea. National Health Service (NHS) statistics reveal that 1,475 people have been infected with norovirus since July, compared to 1,294 last week, which means that the number of people infected by norovirus has increased by 13 percent in one week. NHS are expecting it to be the worst outbreak in 50 years. Extremely contagious, outbreaks of norovirus spread rapidly in closed environments such as hospitals, restaurants, hotels, schools and care homes, and while it’s not always possible to avoid catching it, there are things you can do to prevent the virus from spreading when a body spill occurs. The Oxivir Body Spillage Kit, from our partner supplier Diversey, contains everything needed to isolate, remove and disinfect a body spill. The kit allows catering and hospitality operators to respond quickly before the spill has a chance to spread and cause further contamination. The kit includes disposable protective clothing, absorbent granules, plastic scoop, scraper and bags, and a spray bottle of the Oxivir Plus broad-spectrum disinfectant. All items are supplied in a handy portable carrier designed to be kept at convenient locations throughout the premises for quick and easy access during emergencies. Firstly, when a body spill occurs the user must put on the protective clothing provided in the kit – gloves, shoe protectors, apron, mask and goggles. They must then spray the spill and surrounding area with the Oxivir Plus disinfectant. Depending on the nature of the body spill an area up to one metre surrounding the spill must be disinfected because small, barely visible liquid droplets created by the body spill can travel this far. A sachet of dry granules from the kit is then applied to the spill and surrounding area. The granules absorb any liquid present and quickly form a gel that can be gathered up easily using the scraper and scoop and placed into one of the kit’s sealable plastic bags ready for safe disposal. Once the gel has been removed the area is sprayed again with the Oxivir Plus disinfectant and left for five minutes. Oxivir Plus is a unique and fast-acting cleaner-disinfectant that offers powerful broad-spectrum performance against a wide range of infections and micro-organisms including bacteria, viruses, fungi and yeasts in a single product. Its unique formulation contains patented Accelerated Hydrogen Peroxide (AHP) and is fully compliant with the European Biocidal Product Directive. It has passed numerous standard microbiological tests including EN14476, EN1276, EN13697 and EN13727 with five minutes contact time or less. It also passes EN1650, EN13697, EN13624 and EN14348. AHP kills viruses including norovirus in just two minutes. 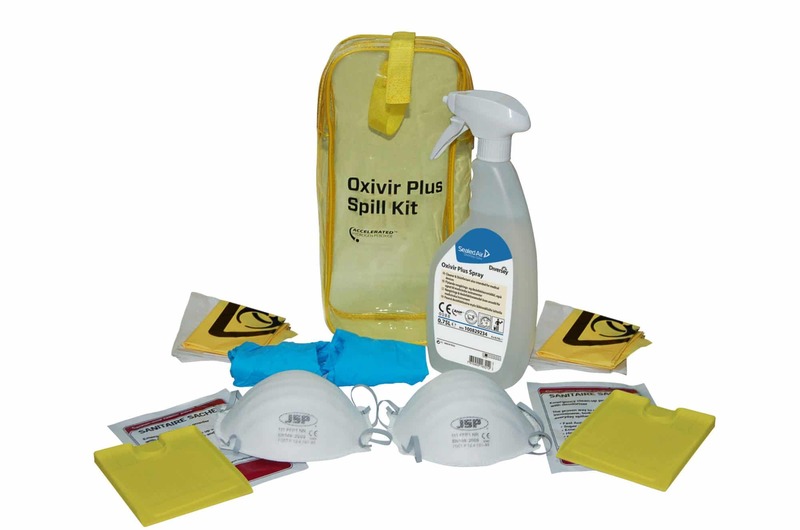 For more information on the Oxivir Body Spillage Kit – please contact your local Bunzl Catering Supplies branch.